Grow tents are ideal for cannabis growers who are looking for a way to control the environment in which they grow their cannabis. Because cannabis can give off a strong odor when it is fully mature, having a grow tent can reduce or even eliminate that odor and make it easier for you to grow your cannabis indoors. What’s more, grow tents come in all shapes and sizes, so whether you want to grow a little or a lot of cannabis, there’s something for everyone on the market. Growing cannabis can be tricky because you need to control the humidity, temperature, and other environmental factors to allow your plants to grow correctly and quickly. Introduce too much heat, and your plants will wither; keep the tent’s temperature too cold and your plants will seize up, and you’ll have nothing to show for your efforts. If you are looking for a great grow tent for your cannabis growing needs, check out the collection of tents I’ve put together to help you understand your options, and what to look for to get the most value for your money. 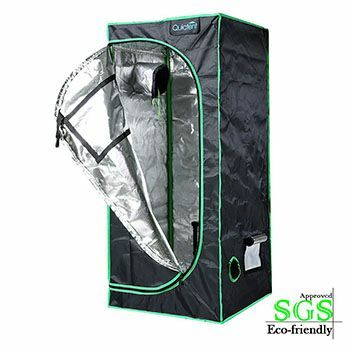 When I set out to find the best grow tent for my cannabis growing needs, I came across the Apollo Horticulture Mylar Grow Tent. This tent had everything I needed to get started, and it even came with an instructional pamphlet to help me get off on the right foot. It is made of reflective tear proof materials so I knew my plants would be safe inside. It’s made with high-quality zippers and stitched well enough to provide light protection and create the perfect environment for my growing needs. The package came with metal poles to support the grow tent, so I didn’t worry about it falling over. The lights are adjustable and I was able to create the perfect environment for my plants to thrive. The floor of the tent is removable, which I thought was pretty convenient because it made it easier to take the plant out and see its progress for myself. The grow tent took only a few minutes to put together, and I was able to transfer my plants to the tent within minutes of setting it up. Of course, these tents aren’t marketed to people who grow cannabis – they are designed for indoor vegetable gardens and the like, but they create the perfect atmosphere for growing anything green in your home, apartment, garage or basement. The Apollo Horticulture Mylar comes with a 90-day warranty, and it even has a 30-day money back guarantee, which was nice because I wasn’t sure what I was getting into when I bought this grow tent. 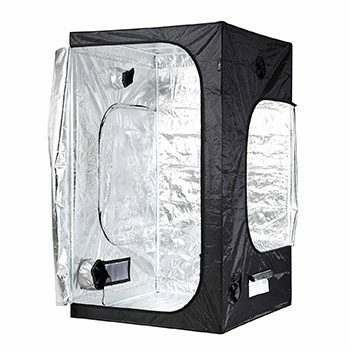 Overall, I loved this grow tent because it was easy to setup, easy to use, and provided a great deal of control over the light, humidity, and environment in which to grow my cannabis. It’s no wonder it’s my favorite pick for the best grow tent: it’s got everything you need to get started and grow your favorite plants. There are none! It’s great! When I was looking at the different options for grow tents, I came across the Quictent, which I think is the best value for your money, overall. I liked it because it seemed to be easy to use and safe for first-time growers. I think you would find it easy to set up as well. The tent has been approved for SGS testing and certification, which means that several elements comply with the use of this tent. No matter what you are growing, you can use this tent. It is practically light proof; while it says it is 100% light proof, it is more like 90% lightproof, but with some simple tweaking you could make this tent into a completely light proof tent. The poles which hold the tent together are sturdy but not as good as the ones in the Apollo tent. I did like that it had a heavy-duty zipper so I felt like I could open and close the tent with ease, and didn’t have to worry about breaking the zipper. Something else I liked was that the company shipped this grow tent in an unmarked box, so I didn’t have to worry about the postal service workers judging me for buying a grow tent. I mean, I could be growing tomatoes for all they know. Anyway, it was a great buy and had a good warranty to back it up. Overall, I think this is the best value for your money, and if you are a bit worried about buying a grow tent, this product comes right to your door marked “tent” so no one will be the wiser. 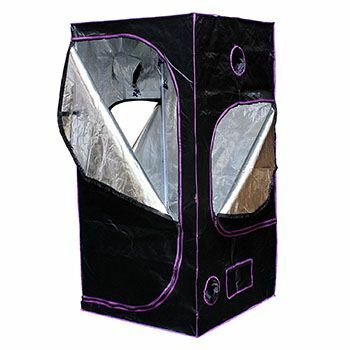 If you are in the market for a grow tent for your cannabis, then the larger Apollo model might be good for you if you have the space to support it. It offers many of the same great features the smaller version does, has a great warranty, and heavy-duty zippers that keep the light out, but it’s much larger and more robust. I didn’t choose it as my absolute favorite because of the square footage that it takes up – it’s practically the size of a small refrigerator. I needed something a bit smaller, but this is great for someone looking to grow more plants the first time around, or for someone who was ready to upgrade their smaller grow tent. The tent is made of mylar and is pretty sturdy with solid poles and an easy-to-setup design. I had this tent together in just a few minutes and was impressed by the size of it. I liked the design of it because it would be easy to keep in the corner without drawing too much attention to it because of the dark color and rectangular size. There are several access points in which you can see inside the tent without allowing too much light into the tent, and you can adjust how much light enters it pretty easily. I think you’ll like this grow tent for its sturdy design and sheer size. Like I said, it’s a good upgrade option or great for someone who has the need for larger plants. Looking at other large grow tent options, I came across the iPower indoor grow tent, which is about the same size as the Apollo large model. I have to say, while this is the same size as the Apollo, it didn’t look as good as I thought it would. It was a lot of silver Mylar that just seemed to glare in my face when I was trying to set it up. 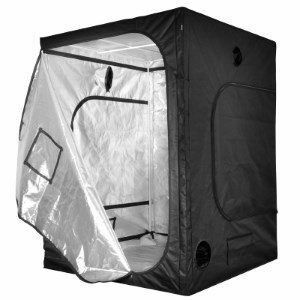 It has a lot of the same features many other grow tents have, including a removable floor so you can transport your plants with ease. It also makes it easy to transplant them when they get too large for the single size grow tent. I thought the zippers worked well, and there was a lot of access points where I could hook up lights and whatnot, but I just didn’t feel like this was as good regarding quality as the other brands and models. Still though, given its tear-proof design and the fact that the tent was rated for up to 110 lbs of weight, it seems like a good option for someone who would be growing a lot of plants. Again, the size of this grow tent is akin to a small refrigerator so you’ll need some space to house this model. The design left me feeling like they could have tried harder to make it at least “nice,” but it’s just plain black and I guess that makes it suitable for any space. Overall, it’s a good option for someone who needs a larger growing tent or wants to upgrade they’re current grow tent for an affordable price. The Gorilla Grow Tent is the biggest grow tent on my list and the biggest one I tested to review. I was surprised at the size of this tent, to be honest. I could stand in it, and I bet three or four other people could too. It is probably the size of a walk-in closet. You could do a lot with this grow tent. The design was nice, I liked the material on the outside, and found that the multiple access points allowed me to confirm the grow tent in a number of ways. You could use this in an upright position or a horizontal position, depending on your needs and storage space. It would be perfect in the garage or basement, out of the way. It’s not something you want to be sprawled out in your living room. Given the large size, you can expect to pay a lot more for this grow tent, but that’s to be expected. The zippers were well built and seemed like they would stand up to use over time. The drawstring access points were sewn well, and I didn’t feel like they would let the light in at all. Overall, this is a great grow tent for someone who needs a lot of plants, or for a group of people looking to share the cost of a grow tent for their various needs. The temperature, lights, and humidity were easy to control for this grow tent as well, and I felt like it was delivering on its promise to provide a professional experience. Still, though, it’s hard to imagine having something this big in your home or garage, so it didn’t make it to the top of my list. Its great for larger growing needs, but for personal needs, or for first-timers, this isn’t ideal. 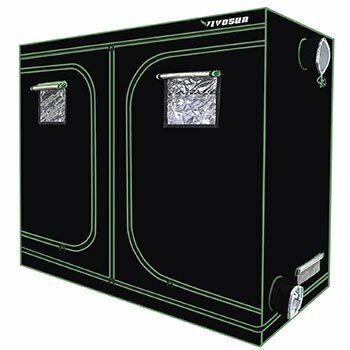 Our final choice for one of the best grow tents on the market is the Vivosun mylar tent. This is a huge tent with a lot of features. It comes complete with high-quality zippers and canvas exterior. It works to keep the light from escaping, as well as getting into the tent. The tent poles can hold over 200 pounds of pressure, and you’ll love how much room is in this thing. Its large size makes it ideal for a basement or garage, and the height makes it easy to tend to plants without having to bend over and trim plants on the floor. It will take you a few minutes to put this tent together, but once it is set up, you’ll be off to the races. It does come with a two-year warranty, which is nice considering you hope to have your grow tent for a long time. The canvas is made from 600D material, which is akin to a really high quality luggage canvas, which takes beatings in airports around the world on a regular basis. That’s pretty good stuff. 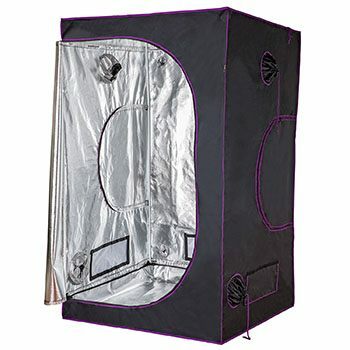 Overall, I like this grow tent for its size, but similar to other large tents, it’s not ideal for anyone just starting out, or with a small space to store and tend to their plants. The good news though is that this tent does come in several smaller sizes, so if you are a fan, there’s likely one to fit your space. As a bonus, you get a tool bag which will keep all of your trimming and support tool neatly tucked away, so you aren’t looking for them every time you need to check in on your plants. There are several things to consider when you want to buy a grow tent. One of the first things you will notice about grow tents is that they all kind of look the same – so how are you supposed to know which one is better? I already went through my picks for the best grow tents for 2019, but if you want to do a bit more research about your options, here are some of the top things to consider. The more you know, the better choice you’ll be able to make. Probably the most important thing to consider when buying a grow tent is the size you are going to need. Grow tents come in all shapes and sizes, but the standard size starts around 3 feet by 3 feet and goes up from there. You can get smaller ones, but most people start out with a standard size and determine how much more they would need after using that size for a while. Another thing you need to consider is the amount of light that can get in and out of your grow tent. Some tents are designed to let natural light in, while others are designed to restrict the natural light completely. If you want to be able to access your plants and keep an eye on them, then you’ll want at least one access point that allows you to see into the grow tent without letting much light in. There are ways to install hydroponic lights into your grow tents, and it is easy enough to do so; these special lights help to create the perfect environment to ensure proper growth of your plants. The most popular material used in grow tents is mylar. It is sturdy, and tear-resistant. It does an excellent job of keeping the temperature regulated and makes sure your lights are reflecting in an effective way inside the grow tent itself. There are many kinds of materials you can choose from, but my recommendation is to spend the money to get the mylar products. To create the perfect growing environment, many products, including cannabis, need to be kept out of natural light and away from other environmental factors that could impact the growth of the plants. When choosing the right grow tent for you be sure to get a product that has heavy-duty zippers and secure access points. Ultimately, this factor is up to you. 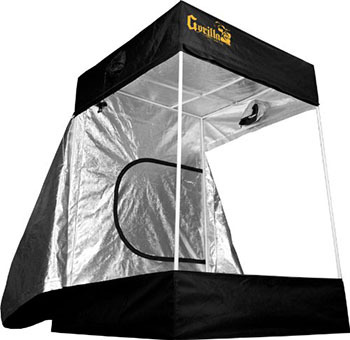 Some grow tents come with poles, light holders for supporting grow lights, extra zippers, carrying bags, and more. Depending on the kind of grow tent kit you get, you may or may not get any of these items. The tents I reviewed didn’t have any extra accessories with them besides the tent poles, but since this is a review about tents and now accessories, that is fine. If you are looking to stretch your dollar though, you might consider investing in a kit as a way to get started without having to source a bunch of products to grow your cannabis. When you set out to buy your own grow tent, consider our grow tent reviews. I think you’ll find that the most important thing to consider is footprint and the ability to keep the light off your plants. If you are planning to grow multiple plants, you’ll want to consider a larger tent, but for the most part, first-timers should get plenty of use out of the Apollo grow tent. As a beginner, there can be a lot of pressure to make the right purchase, so I tried hard to provide you with enough information to get you to the next steps in your cannabis growing adventures. I hope you found this useful, and feel informed to start growing plants of your own. © 2019. Ledgrowlights101.com is a participant in the Amazon Services LLC Associates Program, an affiliate advertising program designed to provide a means for sites to earn advertising fees by advertising and linking to amazon.com.